Wine and mindfulness would seem to belong to totally different worlds, but I think that instead, these two concepts are in some way correlated. Here I will try to explain you the correlation, so bear with me! 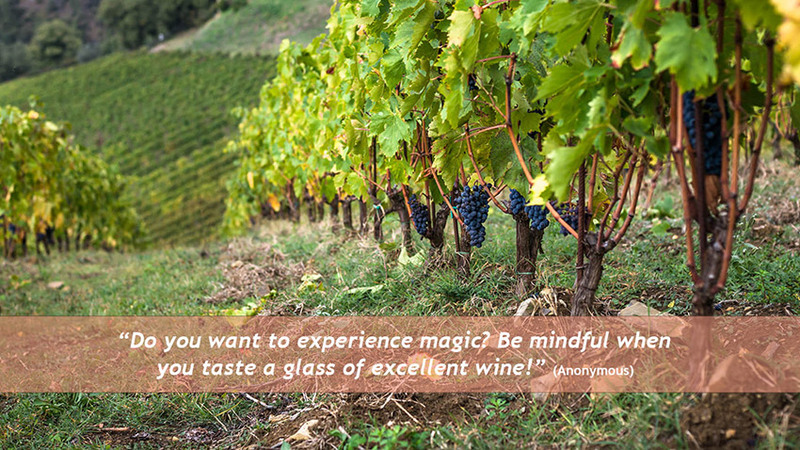 I will first introduce the concept of mindfulness and then clarify the connection with the wine world. Mindfulness nowadays is a highly used concept. And although you can hear people talking about it almost everywhere, it is not so easy to understand and to put into practice in everyday life. John Zabat-Zinn, a professor of Mindfulness and Medicine Emeritus and creator of the Stress Reduction Clinic and the Center for Mindfulness in Medicine, Health Care, and Society at the University of Massachusetts Medical School, defines mindfulness as: “The psychological process of bringing one’s attention to the internal and external experiences occurring in the present moment, which can be developed through the practice of meditation and other training”. In other words, it is the capacity of paying attention in the present moment on purpose and not judgementally as it is nicely explained by Zabat-Zinn in this video. Mindfulness practice is strictly connected with breath and the awareness of the breath. Mindfulness of the breath is the first step of meditation in the Buddhist philosophy and it is considered, in fact, the easiest gateway to meditation for beginners that have never meditated before and approach this technique for the first time. It consists of feeling the sensations caused by the movements of the breath in the body and it is a part of many mindfulness programs. By understanding and practising mindfulness you develop a tool that you can apply every single second of your life. We, as human being, are dominated by our mind. We have ideas, opinions, judgements, desires, expectations, thoughts that make us feel different emotions and feelings. As our mind does not stop working the whole day and we have between 50,000-70,000 thoughts a day according to several researches, we are not always conscious of the thoughts that pass through our minds and how they affect our emotions, our behaviours and the ways we look at life. We also tells us lots of stories, we actually love stories, we make up them all the time, but most of the time we are not aware of these automatic mental processes or we do not pay attention to how this attitude affects us and the environment around us. When you bring awareness to these automatic mechanisms of the mind, you discover a completely new level of being in everyday life. You find more space to be wise, to discern and be able to see shades between black and white and not get caught in your stories, thoughts, opinions, judgements, obsessions and so on. When you become aware of the power of being mindful, it is like having a magic wand. Every time you feel that you are going down the wrong road, you apply what you have learned and you get back on track. It is like training a muscle. In this case, the muscle to train is your mind. It is not always easy and sometimes you are just so involved in the chatter of your mind that you don’t want to get out of it…but whenever you are ready or feel you had enough you can get back to that wonderful space where you feel in peace and harmony with everything. Lots of people probably at this point are asking themselves: what has this anything to do with wine? Mindfulness can be employed in every single aspect of your life. Tasting a wine is a very pleasant experience when usually you are not doing other things, you are not distracted by other devices like computers or smartphones and it embraces all the senses. All the senses are focussed on that very moment when you hold your glass in your hand and you are about to sip your wine. This is one of those perfect situations where you can practice being aware and you experience the beauty and magic of being alive and present. You have your glass, you look at the colour of your wine, you smell the aroma and start thinking about what it is that you are smelling – is it a fruit a flower? What fruit is it? What flower is it? – then you taste it and complete your experience with some delicious food that is just the perfect combination! If you don’t let your mind distract you, the experience can be truly remarkable and this can happen with every situation. If you concentrate on the experience in the present, and try to enjoy what you have right in front of you, every experience of your life can be extraordinary. It suffices to think about how extraordinary is to be alive and to be aware of it! Obviously if what you have in front of you is not pleasant, you just walk away 😉 In fact, the most important benefit of being mindful is that you are always aware of your thoughts and feelings and how they affect you and you are able to act with a peaceful, present and clear mind! So you can take action and be certain that what you decide to do is in line with who you really are, with the authenticity of yourself. I believe that being mindful is an act of love towards yourself and others! 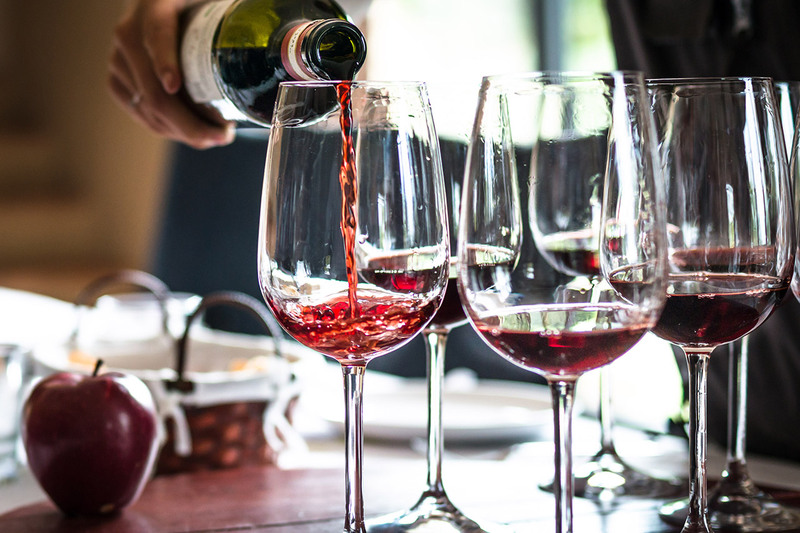 For those that are not wine experts, but what to know more about how to taste a wine, you can read our wine tasting guide! For those that want to know more about mindfulness, please leave your comments or questions below. We would love to hear your comments and suggestions. It helps us to improve our work. If you want to have more information about us and our wines, click here or leave your comments or questions below.